FRANKFORT – A group of local retired and current teachers made their way to Frankfort this week to protest what they’re calling attacks on educators, including issues with Kentucky’s struggling pension system and the state budget. Calloway County Retired Teachers Association President Marshall Ward was part of that group. He said he protested for a handful of reasons. Ward said the group also made the trip to protest budget threats to education, including teacher pensions. The Kentucky legislature passed tax reform and budget bills earlier this week. While educators are getting some of what they lobbied for, including the removal of some public education funding cuts and untouched cost-of-living adjustments for retired teachers, there are still sticking points. One of those, Ward said, is how the pension bill that passed was handled. According to media reports, much of its language was hidden in an unrelated bill about sewage services. “We were very concerned that this secret, transparent process wasn’t democratic,” Ward said. He said another major issue is a new hybrid pension plan that new hires will be subject to. The “hybrid cash-balance retirement plan” combines elements of a pension plan with investment options typically found in a 401(k) plan. He added that while retired educators are happy that COLAs are untouched for now, there were other reasons they were protesting. With a pension plan that isn’t set in stone, Ward said, attracting quality teachers becomes difficult. “If you don’t fund your educational programs, you’re going to have a shortage of teachers, inadequate materials for students to work with, and the people who are here with young children may decide to leave,” he said. 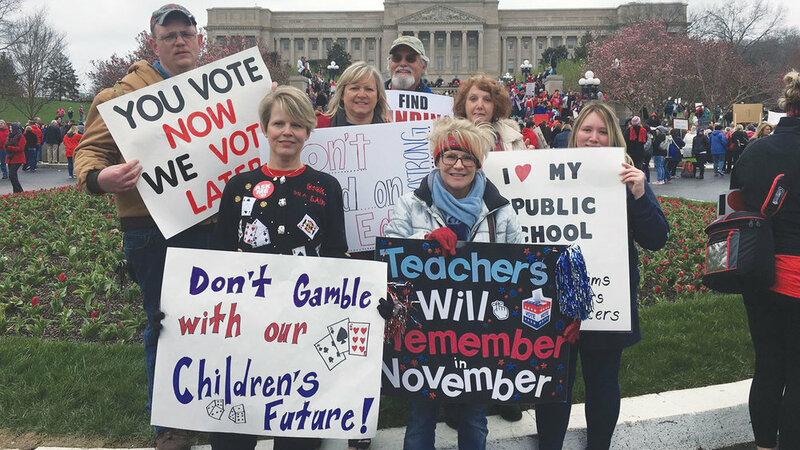 Southwest Calloway Elementary School teacher Gina Crider – who noted her school is a nationally-recognized Blue Ribbon School – also made the trip to Frankfort this week. One of her main concerns is teachers and social security, or more specifically, how Kentucky teachers are not eligible to draw social security benefits. There are two laws Crider is talking about: WEP and GPO, short for windfall elimination provision and government pension offset. According to the Kentucky Finance and Administration Cabinet, those laws are “designed to resolve inequities in the law that had, in the past, permitted some government employees to collect more in social security benefits than was originally intended,” according to its website. “What it does, is for people like me who worked in the private sector – I worked there for 20 years – after a few years, it takes two-thirds off the top of my earned social security that I already paid into, and then I’ll get some remaining portion of that, depending on how long I worked,” Crider said. Crider gave another example. If one half of a married couple makes $20,000 annually and the other person makes $60,000 while drawing social security, and one dies, the survivor gets the larger of the two. Add in the new hybrid plan, and it gets even more complicated. Both Crider and Ward offered sentiments that issues like this won’t go away anytime soon. “I wonder at which point we decided as a state that using our tax dollars to attract quality public servants became a bad thing. That is just hard to fathom,” Crider said. “There was political chanting. ‘We will remember in November,’” Ward said, referring to upcoming elections. He added that Gov. Matt Bevin does have the option to line-item veto any part of the pension and budget bills before they’re signed into law. While the governor hasn’t publicly stated he’d do so, Ward said he isn’t optimistic. “I would almost guarantee it (Bevin issuing line-item vetoes) he said.